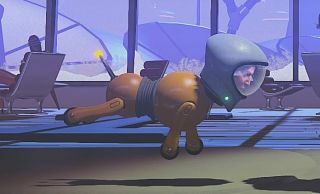 Double Fine Productions has announced that its next game will be a "retro-futuristic, side scrolling, action-adventure" called Headlander, being developed in partnership with Adult Swim Games. You play as the disembodied head of the last known human in the universe, trapped in a 70s sci-fi world of "robotic imposter bodies" that's ruled by a deranged computer. You must uncover its secrets, discover what happened to humanity, and perhaps even change the course of its fate. The good news in all this is that your noodle is stuffed inside a helmet that allows you to fly around, dock with, and seize control of the robotic bodies you encounter, thereby enabling interaction with the world around you. Despite all the shooting in the trailer, IGN says that combat plays a limited role in the game, which actually encourages you to take over enemies rather than offing them. The focus is on discovery, puzzles, and of course bizarre humor, much of it relayed through conversations that will change depending on what kind of body your head is attached to. It all sounds very Double Fine, which is to say extremely strange, potentially interesting, and just about impossible to really grasp without actually playing it. Adult Swim's Headlander website isn't terribly informative either, but it does say that the game is slated for release sometime in 2016. It certainly has some pretty colors.